My new favorite tree ornaments. I got all inspired this week by Ezra, who's just started drawing some pretty cool circle pictures (oh, and he's a lefty like his mama--wahoo! ), so I wanted to figure out a way to use some of his art, as I've used so much of Calvin's in the past to create things. 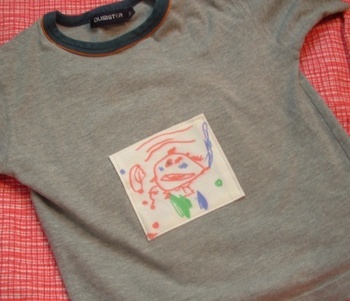 I started with this patch for his shirt (yeah, his shirt that he CUT a hole in the middle of. This would be shirt #5 that this has happened to. Think mama should move the scisors? na!). And then I had the idea for the tree ornaments. I scanned the images of a piece of their artwork each, added text at the bottom (name and year), and printed them off at 3.5x5 size onto fabric, using the Bubble Jet Set stuff. 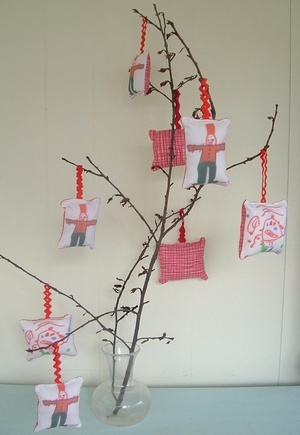 Then I cut them up, and turned them into little pillowlike ornaments (stuffed with cotton), with ric rack for hangers. I'm in love with them. 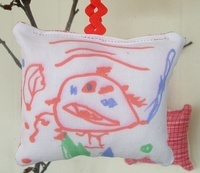 I think they'll make great Grandparent gifts, and I want to save some for our tree too. 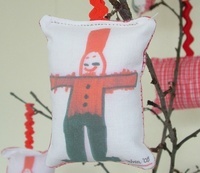 I'd love to do some more--how fun would it be to have a tree with lots of their art as ornaments on it?! But my patience for that Bubble Jet stuff is limited (it always gets stuck in my printer), so we'll see. This might be it.